Last season it was announced that Hart Hanson, the creator of FOX's Bones, was working on a spin-off that was going to be based on a different set of books but still remain in the same universe as the parent series. The show that it ended up being was The Finder. Based on the publicity that this series received prior to its debut, and the plumb post-American Idol timeslot that it received on the schedule, it looked like it could be the next big thing for FOX. While I cannot say that it's FOX's newest breakout hit, The Finder is pretty entertaining. I remember watching the "pilot" last season, and I thought that it had some potential mostly because of the chemistry between the two main characters, Walter Sherman (Geoff Stults) and Leo Knox (Michael Clarke Duncan), but I wasn't sure if it was going to be successful. When the 2011-2012 schedule was announced, the fact that The Finder was going to be held until mid-season (to fill in for Bones when it went on hiatus due to Emily Deschanel's real-life pregnancy), I didn't think that boded well for the series, and the fact that some Bones fans were upset that it was replacing their favorite show was also a bad sign (they are a scary bunch though). I tried to ignore all of that though, and I checked out its first episode of the season, and was reminded of what I liked about it to begin with. During one of the episodes of "The Small Screen Podcast," I talked about my thoughts about that first outing, and how I felt that it gave the show a vibe that most FOX shows don't have. "An Orphan Walks Into a Bar" did not rely on dark humor or gruesome death scenes like Bones, and it wasn't sharp-tounged or sardonic like House. There weren't any alternative universes, dinosaurs or time traveling convicts involved. At it's core, The Finder's a lighter, cop-like procedural that could be found on USA or TNT, but some people think that's a bad thing. I for one don't. I've gone on record about how I'm a fan of this kind of genre (although my patience has started to wear a little bit thin), so I was willing to give The Finder a chance. Last weekend, I was able to catch up on all of the episodes that have aired, and I have to say that I'm really enjoying it. I still think the main draw is the relationship between Walter and Leo, and the lead actors have good chemistry which helps. The rest of the characters are also nice additions, and I appreciate the fact that it doesn't seem like the show's going to bank on unresolved sexual tension like it's sister. Plus, it makes me laugh. Now, admittedly the concept is kind of silly. Walter's an ex-Army MP who received a brain injury while serving over seas. Said injury now forces him to have to find things, and he's turn this new affliction into a way to earn money by taking on odd jobs for people. Sometimes he's asked to locate objects, people, crime evidence and so forth and so on. Since I don't know anything about the human brain, I'm not sure how plausible this hook is, but it's only a plot device to set up the story and to explain Walter's quirkiness, so I'm willing to go with it. 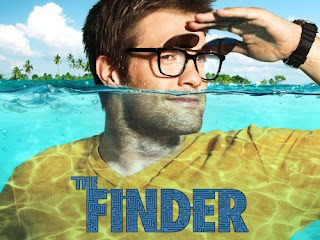 There was a time when I thought that The Finder could be FOX's new flagship, but the numbers and ratings don't support that theory, so I'll be surprised if it gets a second season, yet I'm enjoying it for now. The focus on humor and being unconventional while not concentrating on death and murder makes this show a breath of fresh air, and at least it's doing something different ... at least for FOX.